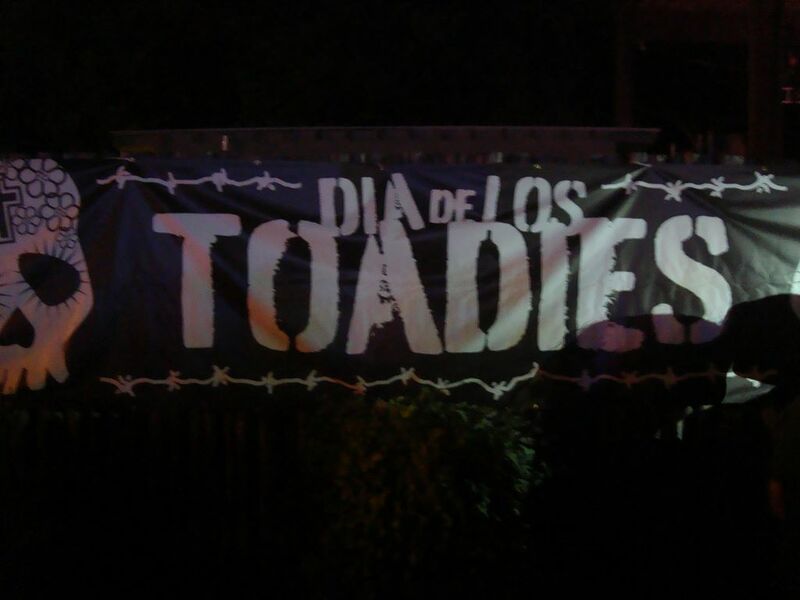 Viva Dia De Los Toadies! So Austin is burning right now. Well, not the whole town, but some places outside of it. The heat and flames reminds of the first taste of Dia de Los Toadies during the last weekend of August. My lovely lady and I battled 110 plus degree weather in the middle of the Texas sun to get our music festival action on. We skipped out on the Friday night acoustic action and did the full on 13 band line up for Saturday. I’ve got some highlights of the show rightcheer so buckle up and grab some Dos Equis, we’re gonna blow through my favs of the day. First up was the Whiskey Folk Ramblers on the main the stage. They kicked off the main stage with a flair I haven’t heard since Mariachi El Bronx. They are kind of a rockabilly band with a heavy flavor of Mexican music. I dug the stand up bass and trumped while they banged away at some epic, classic western movie sounds. The crowd didn’t really show up yet but it was a treat to start out the flaming hot day with some flaming hot Whiskey Folk Ramblers. The next highlight for me was Tornahdo. In the spirit of The Mars Volta and the Omar Rodriguez-Lopez Group, the Austin based Tornahdo brings heavy riff jams and intricate tempo changes on top of some funky jazz keys and spaghetti fingered strings. There’s some tasty instrumental bands out there right now like Explosions in the Sky and Tornahdo steps up to bring the fusion to the next level. I can’t wait to see the guys got at for like 3 hours. My head will be fully blown. So we doubled back and watched some Ume after getting blown away by Tornahdo. Ume to me was the closest representation of what the Toadies would be like if they started out today. It’s a stretch but here me out. The lead puts here heart and soul into some rocking and dour noises. It’s the closest connection that all of the bands there had with the headliner. I’ve never heard of them before the festival but they grew on me and I now consider myself a fan. Anybody who dumps it all on the stage like the lead singer does deserves some respect. So what was the influential force that compelled us to go to Dia De Los Toadies? Was it the Toadies? Nope. As much as I like to relive my 1990s growing up, the Toadies weren’t the real reason I was there. It was The Black Angels. Or as I like to call it, Psycadelic Music With Balls ™. There hasn’t been the same kind of slow, driving, sexual energy coarsing through your earlobes since The Doors. I witnessed ladies out in the Texas sun doing a damn near striptease while they were pounding their sound home. These are men. You will listen them. They will rock. So what could possibly follow that awesomeness? Well, I have never heard of The Sword before and holy moly, did they punch me in the stomach with some good ole fashioned stoner rock. Some people call it fuzz rock or desert rock, but I first heard it called stoner rock so that’s what it is. The Sword took the energy from the freshly set sun and burned it in our heads without remorse. It makes sense that they toured with Kyuss. If you’re the double beer fisiting type like Zakk Wylde then these guys need to be on you ‘to see’ list. So much to my surprise, I got to follow that up with another dip into the stoner rock sauce with The Couch. I had to warm up to these guys, but the trio did the night some justice and made sure the Biergarden was awake after a long day in the heat. These Austin based mates don’t pull too many punches when they are kicking out their riffs. They weren’t as mind blowing as The Sword but I may have been numb with joy by then. That said, they were a tasty treat before the main course of the night. That main course were The Toadies, of course. I forgot how awesome they were. They were recording for a DVD that night and had one minor issue with that (they restarted a classic jam later on), but all in all they put on one helluva show. Growing up in the 90s I was one of those ‘yeah I know them and I have their album’ kind of fans. During their set, I realized that I was way more familiar with them than I thought. I guess The Toadies have always been that way. At least to everyone outside of Texas. Still, they played for over an hour and a half and capped off the night perfectly. Dia de Los Toadies was a win not only for the talent I listed above, but also for the fact that tickets were about 30 bucks. All that show for that low price made it a steal. Granted we spent more out there, but they had just the right specials to even make festival drinks and food a great deal. The only real battle for the day was the heat and we survived. Next year we are locked into going but we will add something else very special. We’re gonna get there and float the river first then check out the show. Sounds like the ulitmate day for me.